Are you having trouble with the plumbing, heating, or air conditioning in your home, office, or business? If you’re in need of a new central AC, a toilet unclogged, or heating repair in Boonton, NJ, then you’ve come to the right place! Rite Rate Heating & Cooling is an affordable plumbing, heating, and air conditioning company in Boonton, NJ! We're a licensed and experienced plumbing, air conditioning, and heating company that offers repairs, installations, replacements, and maintenance. Rite Rate is the expert when it comes to servicing all residential and commercial plumbing and HVAC systems, so give us a call today for a free quote! If your heating system isn’t working you can count Rite Rate to provide you with emergency heating repair on a 24/7 basis. 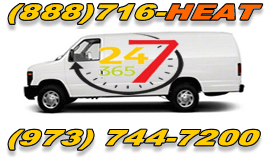 Our heating company in Boonton, NJ works around the clock so you never have to deal with no heat or hot water. Our contractors have the skills to fix any heating system whether it’s a furnace, hot water heater, or boiler. When it comes to installations and replacements, we provide you with a selection of heaters to choose from including oil boilers, gas furnaces, tank water heaters, and tankless water heaters. Moreover, we also perform routine maintenance to keep your heating system working efficiently. Don’t hesitate to call our heating company if you need 24-hour heating repair, a boiler installed, or the hot water heater replaced! As a 24/7 air conditioning company in Boonton, NJ, we understand how important it is for air conditioners to work properly. That’s why at Rite Rate, we offer 24hr air conditioning repair so you can rely on us during the weekend, on a holiday, or overnight. Our air conditioning company also specializes in air conditioning installations, replacements, and maintenance services. The contractors at Rite Rate can easily recommend the best air conditioner for your office, business, or home! Rite Rate services the following AC units: central air conditioning, packaged air, ductless air conditioning, heat pumps, forced air, and air handlers. As the leading air conditioning company in Boonton, NJ, we’re here to help you save on energy bills and stay cool and comfortable all summer long! At Rite Rate, we offer plumbing services such as 24/7 emergency plumbing repair, replacement, and installation. Our plumbers can fix, replace, and install sinks, faucets, showers, bathtubs, toilets, drains, pipes, sump pumps, and the main sewer line. We also offer drain and sewer cleaning as well as water damage restoration. There’s nothing our plumbing company can’t do when it comes to residential and commercial plumbing services! Call Rite Rate today for a free plumbing estimate.